Hiring the right talent for the right job role is a key success component for any business. That’s the reason why most organizations are extra involved and careful during the entire recruitment process. But for the last few years, the traditional recruitment has undergone a drastic change with the introduction of social recruiting. Social recruitment is nothing but utilizing the strength of the increasingly powerful social media platforms for your business’s recruitment needs. Social media networks such as Facebook, LinkedIn, and Twitter, record millions of users everyday, including job-seekers across the globe. The fact that such job seekers are not as active on various job boarding sites as they are on social media makes social recruitment all the more important for small to large-scale organizations. The impact of social media has made it necessary for organizations to indulge in creating a robust social recruiting strategy, let’s find out why. Previously, businesses only relied on the traditional recruitment methods to hire their workforce which was restricted to advertising job postings and waiting for the candidates to respond before interviews could be held. Interviewers had to solely rely upon candidates’ answers for all the details about them. The candidate reach was also limited. But times have changed with social recruiting in the picture. Once considered only an extension to traditional recruitment, social recruitment has come out on its own. It not only allows businesses to reach a bigger pool of candidates but it also empowers them to cross-check the essential facts about them. Employers can take insights into candidates’ interests, networks, past employment records, and personality through their social media profiles, blogs, and internet identity. It allows them to connect with global candidates easily. In fact, social recruitment has simplified the whole communication process for recruitment. With such beneficial aspects, social recruiting has become an integral part of the recruitment process. Almost all the social media platforms let you build your professional profiles or company pages, which is a necessity in today’s virtual world. With company’s social media pages, it becomes easier to portray your organization in a positive light by building your own distinct brand. You can analyze, identify and target your potential audience easily by providing them with useful content and a peek into your organization culture. That becomes helpful even if you are not actively recruiting as such activities contribute towards increasing trust, audience engagement, and interests in your organization. Apart from building your brand, social recruitment opens doors for passive recruitment as well. 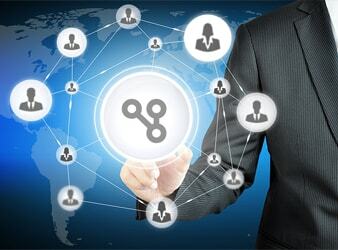 Through social platforms, you can easily connect and network with potential candidates who are not actively seeking a job change, which is impossible to achieve with traditional recruitment. Social recruiting benefits your business by saving overhead recruitment costs considerably. Unlike posting job vacancies and advertisements on job-boards, posting your openings on social media platforms, such as your own company page or communities, is free. However, initially, you might have to spend on ad campaigns to reach and gain a bigger audience. But if your organization is already well-established, people will start following you soon and once that happens, recruiting becomes relatively easy. Other than cost-savings, this process also saves your time. You can hassle-freely carry out candidate screening and even conduct interviews through video calls when there are geographical boundaries involved. With these benefits and dynamic offerings of social recruiting, your organization should also start actively utilizing this phenomenon.